To access lynda.com, you should begin at the library website. 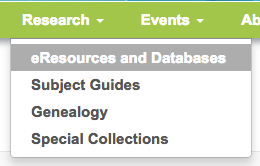 First, find lynda.com in our eResources and Databases Section, under Research in the green navigation bar. In our listing of eResources and Databases search by name, subject, or limit to "L" and scroll to Lynda. When you select it, you will be prompted to log in with your valid library card number and PIN. Go there directly by clicking here!